Trump Champions The 'Silent Majority,' But What Does That Mean In 2016? The phrase has a long history, going back as far as Richard Nixon, who used it to push back against anti-war protesters and 1960s counterculture. Trump Champions The 'Silent Majority,' But What Does That Mean In 2016? At Donald Trump rallies, like this one in Cedar Falls, Iowa, on Jan. 12, his campaign distributes signs heralding support from the "silent majority." In just about every stump speech he gives these days, businessman turned presidential candidate Donald Trump can't stop using the phrase "silent majority." Sometimes he'll ask the audience members if they've heard it before and point out that it's been around for a while. And then he'll say that the silent majority feels abused, or forgotten, or mistreated. And usually, toward the end of his speech, Trump says that the silent majority is back. He rarely spends too much time explicitly defining this group, but at a recent Trump rally in Clear Lake, Iowa, several attendees still had working definitions. "The people that mind their own business, don't depend on anyone else," said Patty Hughes of Indianola, Iowa, when asked to describe silent majority. "[They] don't expect anything from anybody, and they're kind of quiet. They don't go around bragging. They're not activists." Her husband, Larry, said, "They expect a dollar work for a dollar pay. They don't want anything free, but they don't want stuff taken away from them either. And that's happening to us out here in the cheap seats." Others said the silent majority is defined by fiscal conservatism, or disapproval of things like Planned Parenthood, or anger with government gridlock. Dan Fix of Mason City, Iowa, said the quintessential member of the silent majority would be Joe the Plumber, or in Iowa's case, he pointed out, Joe the Farmer. Though Trump may have brought the idea of the silent majority to the forefront this election season, it actually has a long history. It's been around for some time, at least since Richard Nixon made the term what it is in the modern era. "It comes deeply from Richard Nixon's basic political orientation," said Rick Perlstein, a historian who has written multiple books on conservatism and the Nixon era, including Nixonland: The Rise of a President and the Fracturing of America and The Invisible Bridge: The Fall of Nixon and the Rise of Reagan. Perlstein points to a speech Nixon gave on Nov. 3, 1969, defending the unpopular Vietnam War, at a time when anti-war fervor was mounting. "On Oct. 15, 1969, there was a massive anti-war demonstration," he said. "Two million Americans of every walk of life — from small towns, from big towns, young people, old people — basically took off work or school in a moratorium against the Vietnam War. And it really looked like the movement against Vietnam, after a grace period or a honeymoon that Richard Nixon enjoyed, it entered the mainstream of American politics, and Richard Nixon and his White House immediately went to work to try and discredit that massive outpouring of mainstream support for the anti-war movement as somehow not quite American." In one line of that November speech, Nixon called them out directly, speaking of protesters in San Francisco carrying signs that read "Lose in Vietnam. Bring the boys home." "As president of the United States," Nixon said, "I would be untrue to my oath of office if I allowed the policy of this nation to be dictated by the minority who holds that point of view and who try to impose it on the nation by mounting demonstrations in the street." And later in the speech, it came: "And so tonight, to you, the great silent majority, my fellow Americans, I ask for your support." Perlstein said the speech, and the language of the silent majority, was a distillation of Nixon's political philosophy, "the idea that there are two kinds of Americans — the ordinary middle-class folks with the white picket fence who play by the rules and pay their taxes and don't protest and the people who basically come from the left." And over time, the term silent majority was used to exclude more than just anti-war protesters. The "noisy minority," as Perlstein called it, was fairly large. "It was black civil rights militants," he said. "It was feminists who were supposedly burning their bras. It was students who were smoking drugs. It was rock 'n' roll bands. It was everything that threatened that kind of 1950s Leave It to Beaver vision of what America was like before everything literally and figuratively went to pot." 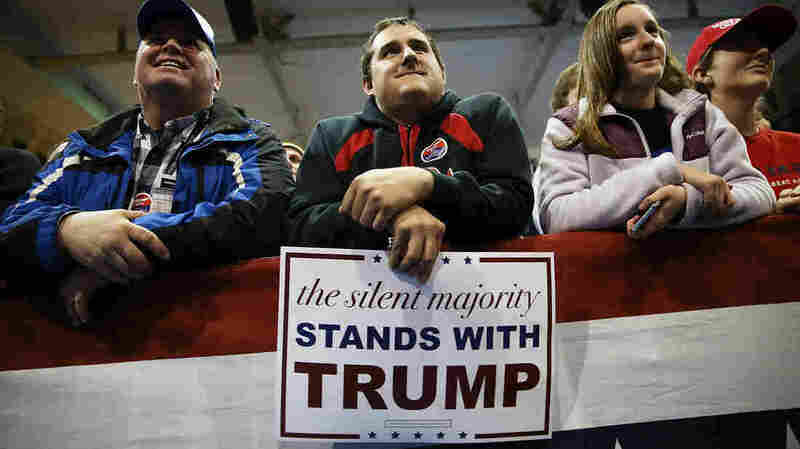 A recent Hoover Institution study found that just over a third of Donald Trump supporters are over 65 years old, so a good portion of people hearing him speak of the silent majority might remember that time well. Perlstein also pointed out that, in some ways, the phrase was racially coded. "To say majority is to say minority, and everyone knows who minorities are. They are people in America who are not white," he said. Of course, in many ways, 2016 is not the 1960s, and multiple Trump supporters have told NPR that they don't think the term "silent majority" has a racial connotation. "I don't think that's true at all now," said George Davey of West Des Moines. "You can look at Trump, [and the] people he hires. I'm sure he has a lot of people of various ethnic backgrounds in his companies." Davey has a photo of Trump that's several feet tall looming over the fence of his backyard, looking onto a busy street. He says he is a big Trump fan, but he didn't want to share whom he plans to caucus for just yet. To Davey, the silent majority today is all about opposition to the rise of what he calls "PC culture." "The reason why we're silent is because we're not allowed to talk," he said. "My favorite thing about Trump is that he wants to get rid of political correctness. It all started out as anti-bullying, where all of a sudden you can't say certain things because you're bullying them." But Davey said it has snowballed, and now, he thinks people can get fired from their jobs, or sued, just for saying the wrong thing. "That is against the Constitution." Whether Davey's opposition to political correctness perfectly matches Nixon's modern definition of the silent majority or not, historian Perlstein says it really doesn't matter. "The silent majority is always going to be a state of mind," he said. "It's a feeling. It's a feeling of dispossession. And that feeling of dispossession can come about most dramatically in times when things seem to be changing, when all that's solid melts into air." The caption with a previous photo on this page incorrectly described it as showing a photo of Donald Trump. The photo was actually of a supporter of Bernie Sanders.